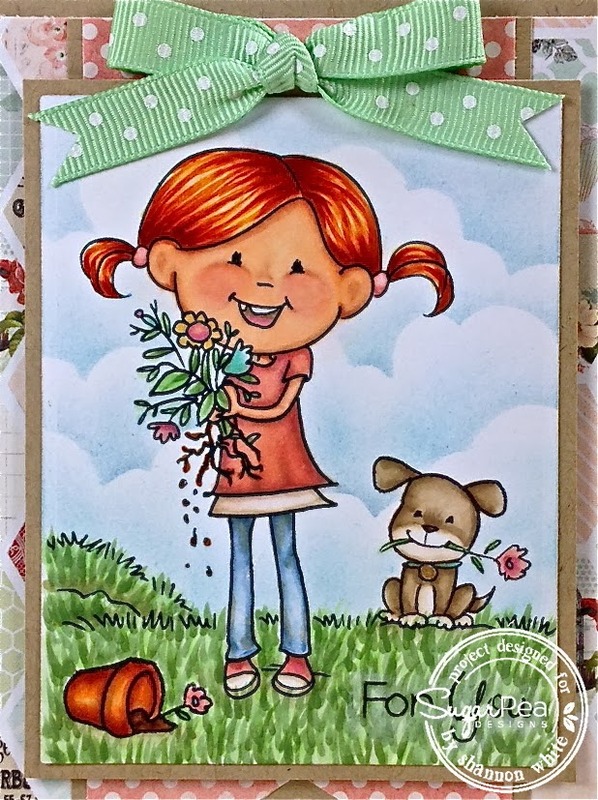 Sooooo, Would you like to WIN the Love You Bunches stamp set?! Hop along and leave some blog love for our designers. One lucky person will be randomly selected to win the Love You Bunches stamp set. We will be announcing not only the winner of today's stamp set, but also the winner the entire March release to one very lucky person who attends our online release party on the SugarPea Designs Facebook page this Thursday night between 8:00 and 9:00 PM EST! The March release will be launched in the SugarPea Designs online shoppe at 9:00 PM EST this Thursday night! Great design and choice of colours...sweet image too. sooo super cute! love the scene you colored-wow! Ohhh I really really really love her!!! Gorgeous card!!! Adorable card, Shannon! Love the papers and the wonderful little scene you created! Terrific coloring! pure sweetness...there are those FAB clouds...you are the queen! Beautiful and I love your papers and hexagons! So cute! Love those clouds! Darling stamp, love the papers and colors you used! Cute, cute, cute. I always love how you color your backgrounds to make the perfect backdrop for your stamped image. Great job Shannon. I particularly love the layers clouds in the background. A technique I have not yet mastered! :-) The darling pup makes a good companion to this sweet little girl. I love it. Your card is gorgeous! I love your paper choice, and the additions of the pooch and flower pot make a charming scene. Such a sweet little girl! Thanks for the inspiration! This is fabulous, Shannon! WOW! Your colouring is incredible...LOVE, LOVE, LOVE the sky too! Such a sweet Sugar Snap set! Wow, not only great coloring but you created a whole scene as well. Wonderful! Love your coloring and your choice of paper. Your hair coloring rocks! Beautiful coloring Shannon. I love how you colored the doggie. Great scene. Such a cute card! Love the image and your use of it! Can't wait to see grass that color... Nice job! Eek, so sweet!! I need to do some clouds like this they look so pretty and fluffy!! She looks so happy!! Lovely card! So pretty! Love your polka dots and that beautiful cloud background. oh my word, HOW CUTE! She is just so cute with her missing tooth.